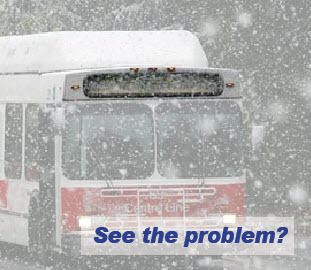 Clear View II Electric Defrosters make it easy to install high quality defrosters that deliver the heating performance needed to keep bus destination signs free of frost, snow and ice. Used by Gillig, NABI and other bus manufactures the Clear View II destination sign defrosters melt snow and ice even in tough winter conditions. Based on proven Clear View II technology defrosting is accomplished through contact between the Clear View elements and the window. The defroster elements come on pre-spaced rolls for easy and accurate application to the window. The elements can be trimmed between the minimum and maximum lengths for a custom installation and are color matched for a factory look. Clear View II defrosters are trimmed to match the sign length during installation. 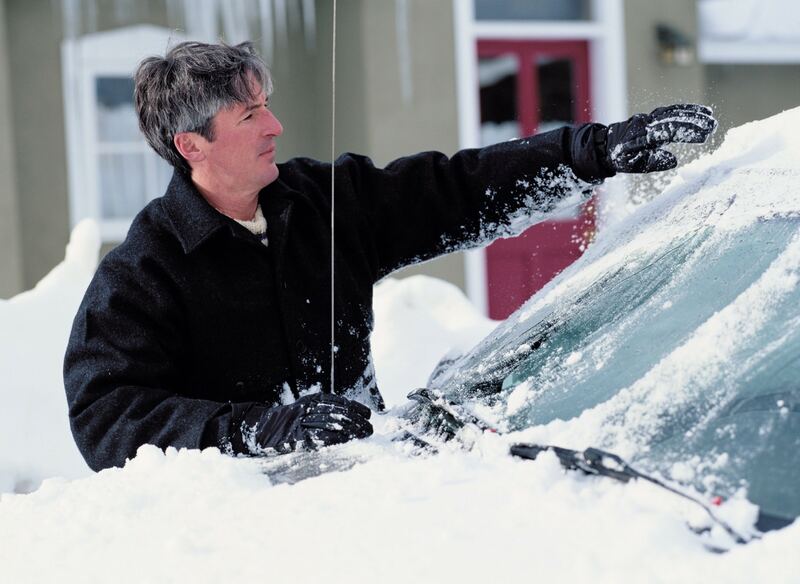 The heating elements bond directly to the glass and are connected electrically to the vehicle using the defrosters integral buss bar tabs. The defroster has an electrical resistance which when powered provides the heat needed to clear windows of snow and ice in minutes. Heating is accomplished through contact between the defroster elements and the window. These simple but very effective defrosters have been clearing bus destination signage for over twenty years for several major manufactures. Electrical connections to the defroster are made using the tabs integral on the defrosters side buss bars. The defroster control is easy to connect using the supplied wire harness. Defrosters are available complete with the ThermaSync timer controls, defroster activation switch, wire harness and installation pack for easy installation or as defroster only options. All Clear View defrosters come with a set of general instructions and attachment detailing the exact defroster being installed. It is critical that the instructions be understood before installation. Clear View defrosters use ThermaSync controls which provide several options including operation of multiple defrosters with a single switch plus a range of automatic timing options from ten minutes to continuous operation. Standard timing is 20 minutes on. Clear View Bus Destination Sign Defrosters include six gridlines measuring 7.5 inches in height. Minimum length is 41 inches, maximum 50. Connection tabs are both on the same side. 12 Volts. Defrosters are available many sizes in 12 and 24 volt. OEM discounts are available. Clear View Bus Destination Sign Defrosters include six gridlines measuring 7.5 inches in height. Minimum length is 48 inches, maximum 71. Connection tabs are both on the same side. 12 Volts. Clear View Bus Destination Sign Defroster includes six gridlines measuring 7.5 inches in height. Minimum length is 68 inches, maximum 84. Connection tabs are both on the same side. 12 Volts. Whats Included : Stick Kit – Includes only the defroster. Not finding the destination sign defroster size your looking for? Contact us!